Barnes & Noble does not have the world's best manga selection, but sometimes you can stumble upon something great. 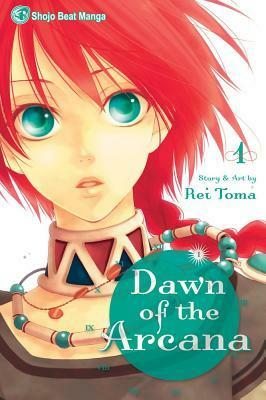 I was walking through the section the other day and randomly picked up Dawn of the Arcana. I hadn't heard anything about it. What a great first volume! It's a high fantasy set on a small island made up of two warring nations. To maintain a temporary peace, royalty from each nation frequently marry. Here, Princess Nakaba from the poor nation has married Prince Caesar of the rich country. Nakaba's only friend of Loki, a demi-human - he basically looks human but has dog ears and enhanced physical abilities. Demi-humans are treated as sub-humans, subject to death for slight offenses. This first volume sets up the world and the characters well. Prince Caesar is a wonderfully constructed, complex character. Initially, he looks like a cardboard villain. He is cruel, but there are hints of principle and personality that makes me somewhat like him. Princess Nakaba is hardened and distrustful, but also resourceful and brave. Loki is steadfastly loyal and intelligent. If you haven't heard of Dawn of the Arcana, I highly recommend checking it out. It's nice to read a series for once that doesn't feel overly silly. Love the cover! I've seen this one around before but never knew what it was about. It's funny that I don't read much of high fantasy manga whereas it's one of my favorite genres when it comes to books. Anyhow, glad that this is not "overly silly" like the one you reviewed last week, lol. I've heard of this one somewhere but now I can't remember if it was a manga site that I usually get recommendations from. I haven't tried a fantasy genre yet but I'm excited to see how this series develops. I might have to hunt this one down. I love this manga! I'm quite a few volumes in and it's really amazing. The whole concept behind the world and culture feels really unique even as it hits on all sorts of issues that would applicable today. And I really enjoy the artwork too!